Despite my dislike of chilli, I love to eat curry dishes and my favourite is none other that a hearty bowl of chicken curry! I usually keep it simple with just chicken and potatoes, which you can see here. 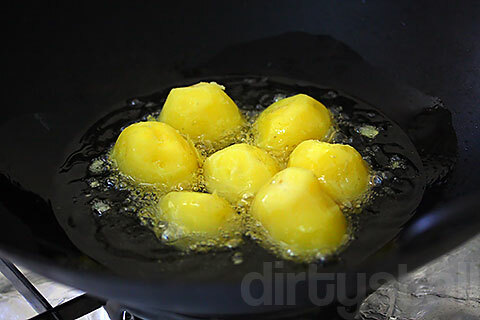 I fry them gently to give them that savoury taste on the outside, then put them aside until the ending. Next here is the aromatic rempah that was made the day before. 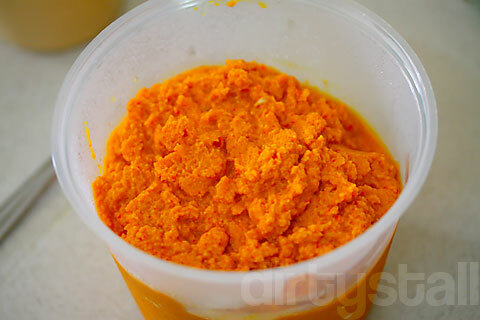 It’s basically a Malay spice paste, made by grinding together various ingredients such as dried shrimps, belachan, garlic, tumeric, ginger, onion, etc. 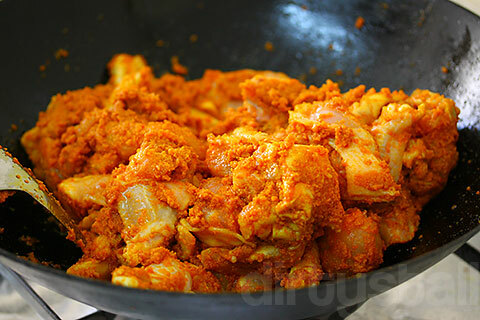 Then I threw in the chicken chunks to fry together with the rempah so as to impart the flavours into the meat. Next component is the coconut milk, made by grating the white coconut meat. 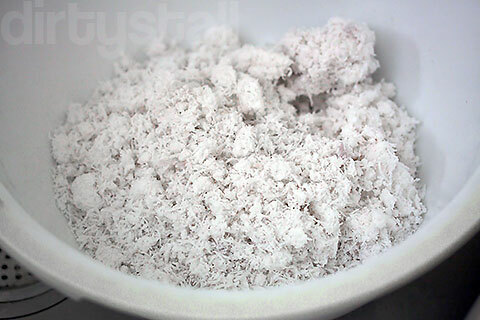 Then you take that grated coconut, add warm water and start squeezing the shavings. 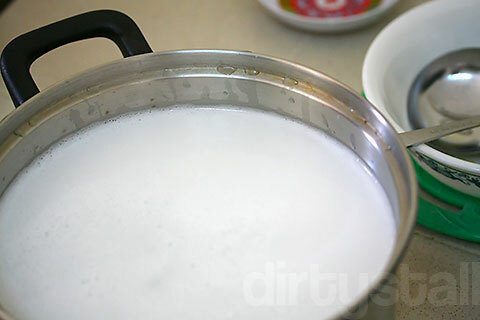 Repeat with more water until the liquid thickens, then strain it to finally get the coconut milk. Add that to the rempah and chicken in the wok and leave it to simmer. 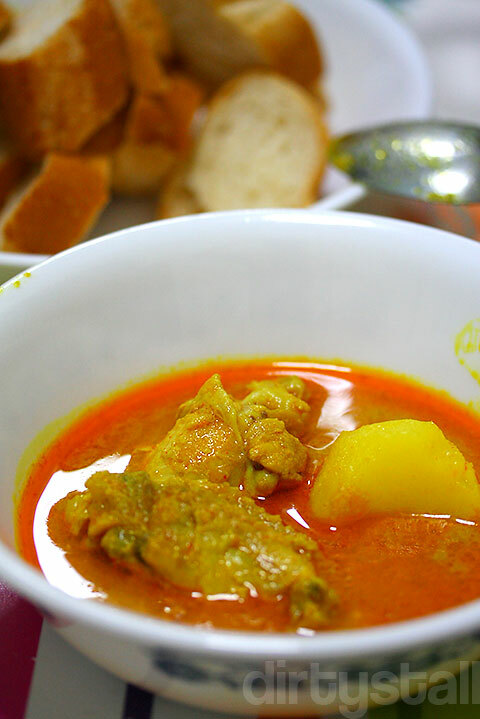 18 Responses to "Chicken Curry"
same here, the only spicy stuff i eat are probably nonya curry and nasi lemak chilli! Haha for me I love pepper and curry. I can’t stand chilli or belachan lol! Adding some candlenuts to the rempah will be nice and can tone down the spiciness too! Do try it. Ohh that’s an idea to try for the next time I make curry! This looks very classic nice curry …. yums! wow i also dislike chilli but love to eat curries! i usually go for the Japanese curry which is less spicy or my mum’s rendang (which the spiciness is toned down). hrm…is rendang considered a curry? 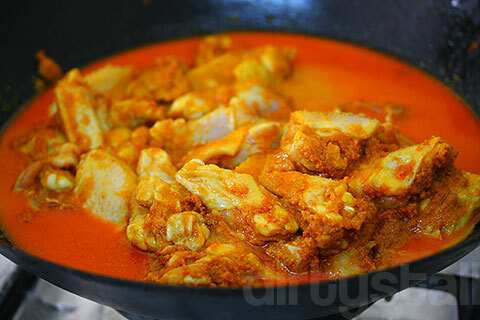 Hmm the preparation and concept of rendang is similar to curry but the end result isn’t really very similar to curry because it’s more dry and more paste-like than curry. Haha yah, I think it’s cos we don’t like the taste of chillis! 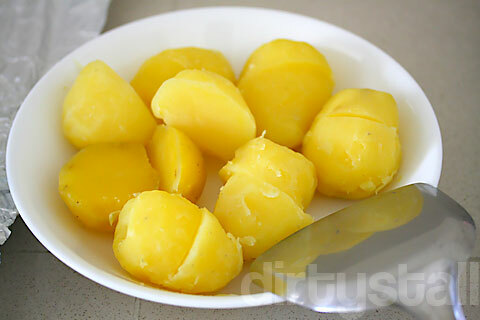 Frying the potatoes is a great idea. Have to try next time! I can’t take too much spice either but I like a good sambal & curry sometimes. 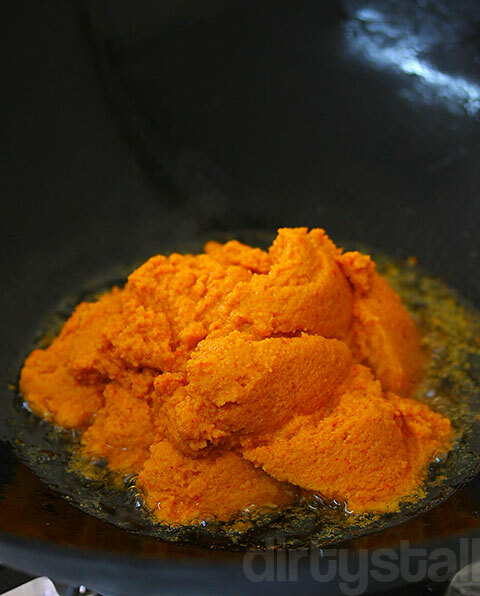 One shortcut way out is to add a spoonful of sugar to the whole pot to tame the curry’s spiciness. Try it, it works. The pictures look great! I really like ur blog. Its not easy to take pictures especially when u are cooking. yet u even take pictures for the steps involve. Feeling hungry looking at the pictures..
Did u add curry leaves? Thanks! And yah it’s not easy to take photos when you’re cooking, quite troublesome in fact! But it’s something I enjoy so I’ll keep doing it hehe. But I didn’t add curry leaves because the family doesn’t like the taste of it.